The newly formed Oxford University Brass Quintet brings together some of the most talented brass players currently studying at Oxford. 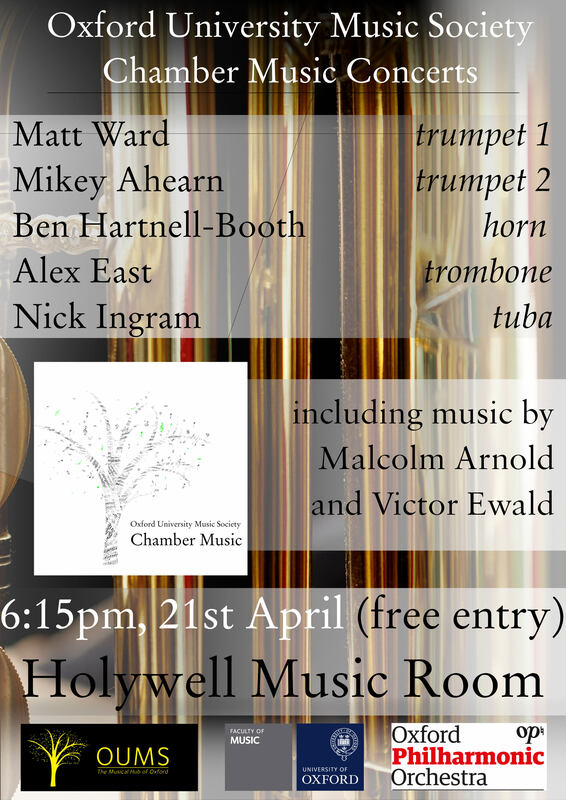 Matt Ward, Mikey Ahearn, Benji Hartnell-Booth, Alex East, and Nick Ingram will be performing some classic brass repertoire such as movements from the Malcolm Arnold and Victor Ewald Brass Quintets. Alongside this, a section of numbers from a five-piece brass arrangement of West Side Story will round off the concert. These five players regularly play alongside each other in OUO, OUJO, and OUPhil, as well as non-OUMS affiliated ensembles such as The Donut Kings, DFO, and Garfunkel. It promises to be a great debut for the group that is not to be missed! The concert is free and unticketed. Doors open at 17:45.